This week we’ve learned that weather forecasting is not an exact science. The predicted two to three feet of snow ended up being less than 10 inches of slush. Perhaps the lesson is not to call something “the biggest snowstorm in the history” and hit the panic button, before it materializes. Don’t get me wrong, I understand and appreciate the precautions for the worst case scenario. The response of city officials was determined by the information they were being given by the National Weather Service. Which was that this was going to be a huge storm. However, next time I suggest using caveats such as “it’s likely to”, “it seems like” or “there’s a chance that” when declaring a natural disaster, before it actually happens. Anyways, I have never seen such hysteria over an impending snowstorm. Residents rushed to stock up on food and water before the worst of Juno was set to hit. No, we are health-conscious citizens of the new millennia, and we care about having kale, blueberries, chia seeds, coconut oil, and goji berries in our fridge/pantry. We want our nutrient dense, antioxidant packed, vitamin jammed, powerfoods. No snowstorm will deny our bodies of all of that goodness. Am I right? For real though, on Saturday there was a shortage of kale at branches of Whole Foods from Brooklyn to Bowery. On Twitter some even joked of an impending ‘Kale-pocalypse’, with not a trace of the close cousin of wild cabbage to be found. I, for one, stocked up on avocados, and blueberries. Well, to be honest, I didn’t really stock up on anything, let’s just say that I bought more avocados and blueberries than I usually do. 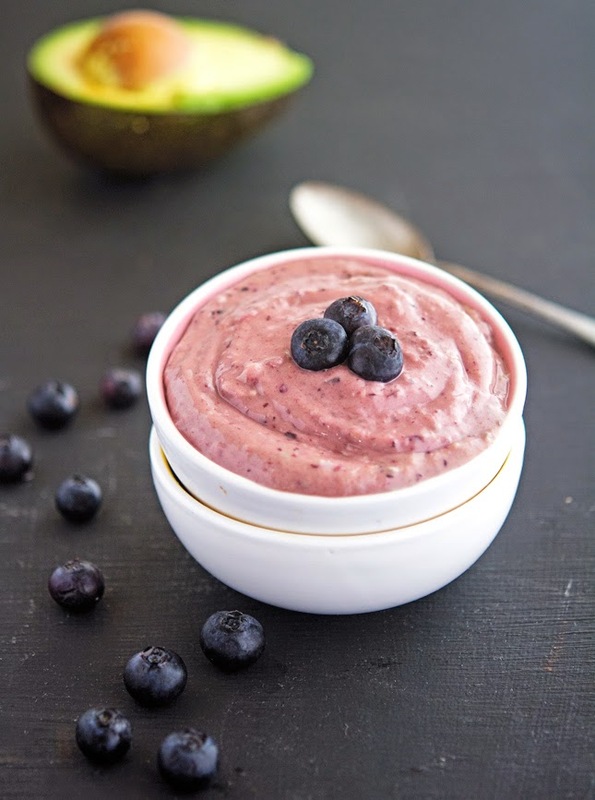 As catastrophe was avoided I was left with all that extra produce, so I whipped up this incredible Blueberry Avocado and Chia Breakfast Pudding. 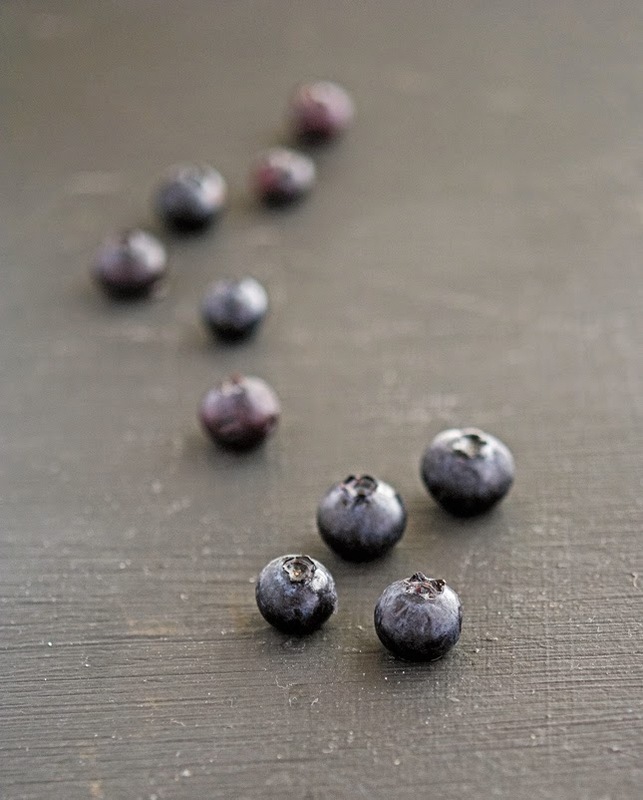 It tastes like blueberries with just a hint of vanilla and a touch of sweetness from the maple syrup. It's velvety, rich, oh-so-good and a snap to make. I call it breakfast pudding because if you're going to eat it in the morning, certainly that's a good start to your day. However, it's also a great dessert at any other time of day. Don’t wait for the next snowstorm to hit to make this pudding, go make it now! 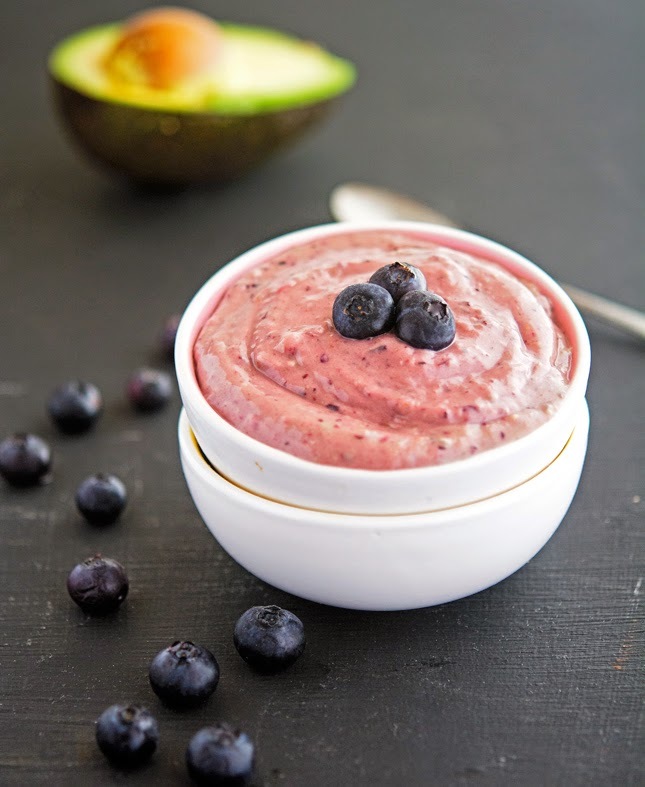 Blueberry Avocado and Chia Breakfast Pudding Print this recipe! Combine all ingredients in a blender and blend until smooth and silky. You might need to stop the blender every now and then and mix with a spoon to make the blending easier. One serving yields 296 calories, 19 grams of fat, 34 grams of carbs, and 3 grams of protein. Sometimes, I guess it is better to be over prepared than the opposite - at least, that's what I think after snowmageddon in Atlanta last year, when just a few inches of ice and snow ended up with people stranded on highways for 9+ hours just because state officials here chose to wait...it was a mess! But, what isn't a mess - is this pudding - yes to stocking up on healthy "nutrient dense, antioxidant packed, vitamin jammed, powerfoods" and YES to pudding for breakfast! We got the expected two feet out here on the island but I couldn't grasp why this was going to be the most historic snowfall for us. I mean, hasn't it been snowing these types of amounts like every year for the last few years? It seems that way anyway. I couldn't agree more with you Meredith! Lol I am in California but I did appreciate the freak out Monday posts and then the oh actually.... Tuesday posts. You're totally right, Tuesday was definitely a "Oh well" kinda day! So incredibly cool, looks almost too good to be healthy. My boys would devour this and not even realize how good it is for them. Legit. Am I being redundant? Every recipe just looks so YUM! :) thanks for another great post! Since you love indie music so much, how about this (eventually not so) fitting tune? A true foodie would have a fully stocked freezer and fridge....an even better one would have their own bloody kale tree. 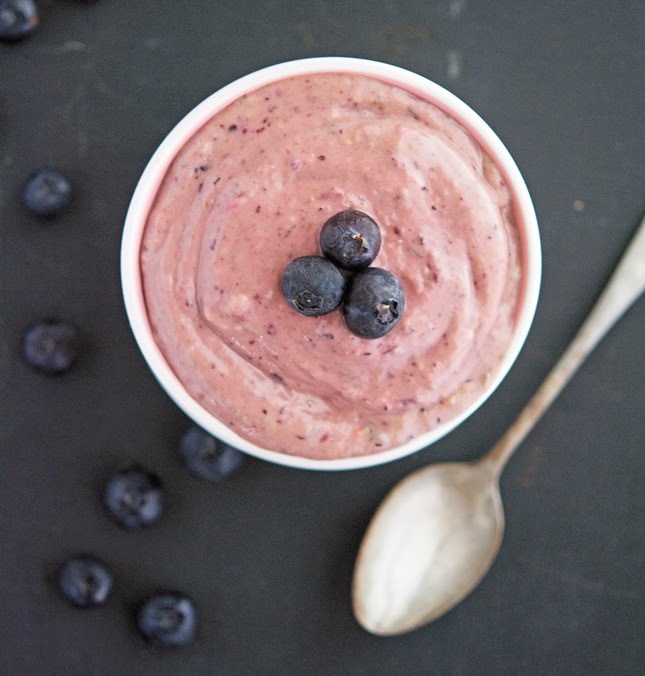 This looks delicious and I'd even reconsider trying chia pudding again for it! I'm alive and in one piece. How 'bout that? Do you know who inspired me to make this breakfast pudding??? The stores were jam packed around here prior to the snowstorm, when I simply ran in to get spinach for dinner. I asked the sales clerk what was going on and she informed me! It must be so miserable to be working in stores when everyone is in a frenzy. This 'pudding' looks like a sweet treat! Thank you! So I acutally flew out on Monday and then came back on Wednesday. I got to miss the entire event...but of course I left my wife here to deal with it. :-) From the predictions, it sounded like we needed to be prepared to be marooned for weeks if not months. Like New England should have just closed it's doors, turned out the lights and hung a sign out that said "Be Back in June." I wish I had a job where I accuracy just doesn't matter! I have your chocolate avocado mousse waiting in line to try, and now this. Officially, I cannot keep up with you. Sally - I made it again yesterday, a full batch this time and I noticed the brown tint. I squeezed a slice of lemon over the surface this time and stirred it in. The pudding was definitely less brown later! Just polished off the last one... I will use lemon juice next time, thanks! Very delicious mousse! Hi Mike, it's in the 70's here, gotta love the national weather service. Been here only a week or two and this is the third recipe I have tried. This pudding is awesome, I have just come from the kitchen where I made it for later this evening. Did some tasting along the way and I am very happy with the results... I look forward to having it later. Again, I did not have everything on your list on hand but am happy with my substitutions and halved the recipe: 1/2 avocado; 1/2 c blueberries; 2 tsp yogurt; 2 tsp agave syrup; 1/2 tsp vanilla; but still 1 tsp ground chia seeds. I used a whole tsp because I like them and I ground them because I like to have them ground in recipes of such a creamy nature. Again, thank you for working so hard to share your adventures with us! I love how you tweaked this recipe. Adding yogurt is pretty clever, I need to try it as well. Thank you for the feedback Siobhan, I really appreciate it! 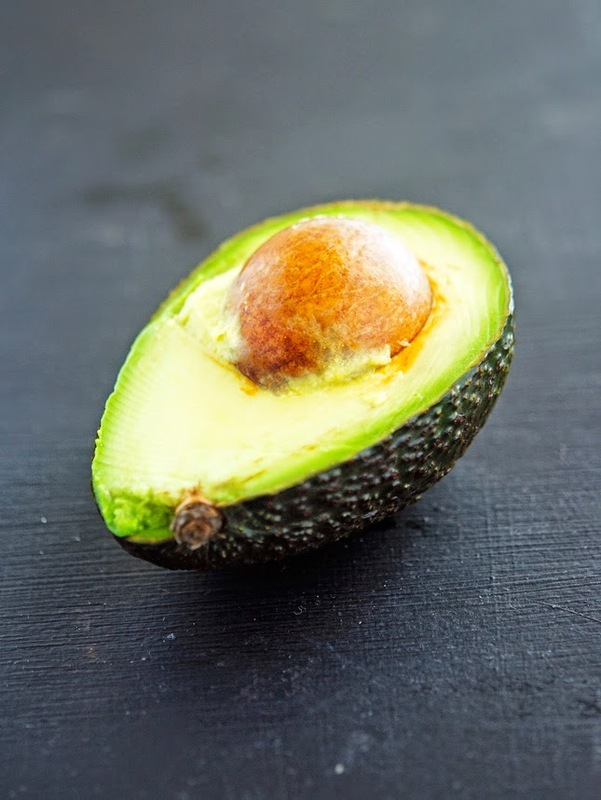 I've been on a chia kick lately and this looks like the perfect way to branch out - I've never tried chia and avocado together before but it sounds like a delicious nutrition powerhouse! Good choice if you are having a healthy diet. It can be a good morning breakfast together with a fitness workout. Then I will be taking my lunch in one of hong kong best brunch.. (then will have my diet ruined. haha lol) Kidding aside, I am a fan of avocado, since it is one of those healthy fruits that you can use as a dessert or dishes. I will try making this every Sunday. Yay! i made this several times but it always turns brown. I tried lemon but, in 30 minutes it is brown. I really like this but need a solution to the browning, help. Great recipe I make this all the time but I like to add 1/4t lavender extract and juice from half a lemon. I just love making little variations to recipes in fact I've altered this in many ways thanks so much for sharing it's my go to for pudding I always have avocados and blueberries on hand.